When Southeast L.A. native and vegan cook Jocelyn Ramirez’s father was diagnosed with cancer for the second time, she decided to try to speed his recovery through nutrition. Ramirez crafted a plant-based smoothie diet for him and his health started to improve, so much so that even the doctors were impressed. However, during the process, Ramirez realized that she was spending a lot of time traveling to other neighborhoods in pursuit of the ingredients she needed. That’s when she started playing with the idea of starting a small smoothie business in her own neighborhood. Knowing that many people tend to be turned off by the idea of tofu and other traditional “health foods,” she figured smoothies would be a good way to make plant-based eating palatable to the kale-wary. “I was just trying to do something that’s inspired by my familia and my community that’s good for people,” she says. Todo Verde, an East Los Angeles based start up, was the result. 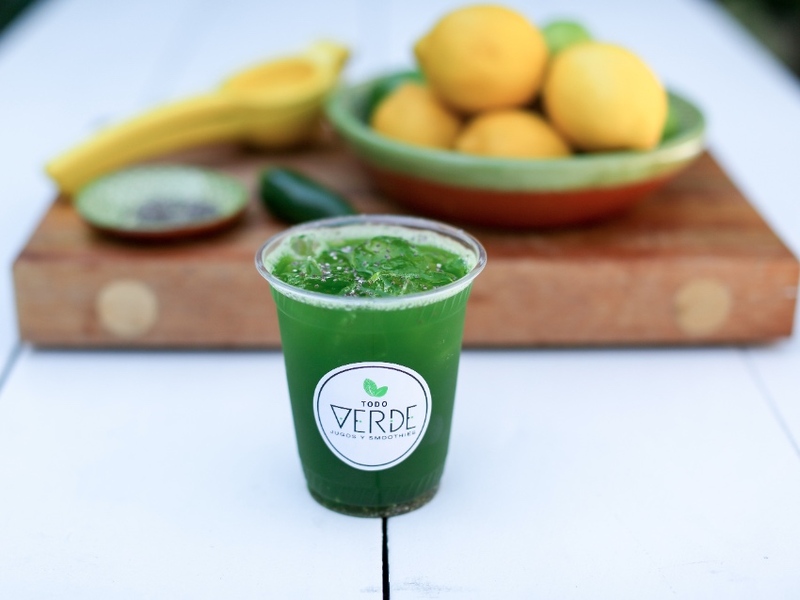 Currently selling at farmers’ markets in Highland Park, Downtown L.A., and East L.A, Todo Verde specializes is smoothies, juices, and aguas frescas made with superfood ingredients. The Kaliente, a customer favorite, is a blend of kale, jalapeño, lemon, chia seeds, and maple syrup; the ¿Serio? Smoothie (as in “seriously?”) is whipped up with avocado, kale, maca powder, dates, and coconut milk. All of the produce is purchased from local markets, and superfood ingredients are sourced from Herbs of Mexico on Whittier Boulevard. A brick-and-mortar Todo Verde on the Eastside is Ramirez’s goal. In the meantime, she’s working to grow her business’ visibility through markets and pop-ups. Todo Verde’s first solo pop-up will take place this weekend and Halloween weekend at Echo Park’s Sunset Stud.io as part of the venue’s Weekend Pleasure series. Along with the drinks, there will also be live music and a few yoga classes offered. Todo Verde‘s pop up will take place October 17-18 and October 31-November 1 from 10:00 am – 5:00 pm at Sunset Stud.io, 1545 Sunset Boulevard. They operate regularly at the Highland Park, East L.A., and Friday Downtown L.A. farmers’ markets.